In the past year, local SEO has run at a startling and near-constant pace of change. From an explosion of new Google My Business features to an ever-increasing emphasis on the importance of reviews, it’s almost too much to keep up with. In today’s Whiteboard Friday, we welcome our friend Darren Shaw to explain what local is like today, dive into the key takeaways from his 2018 Local Search Ranking Factors survey, and offer us a glimpse into the future according to the local SEO experts. Howdy, Moz fans. 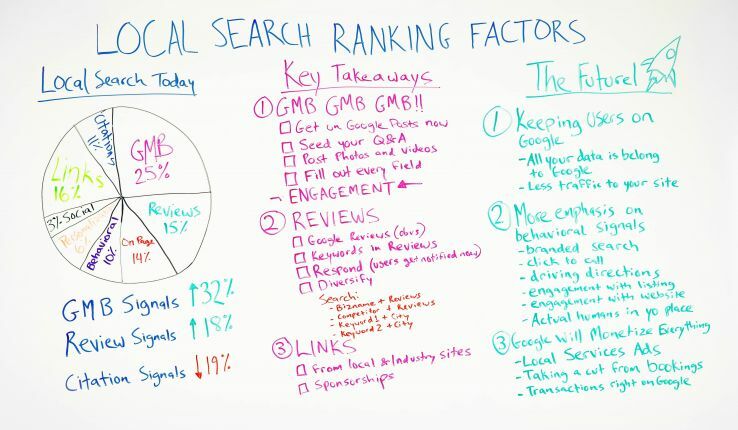 I’m Darren Shaw from Whitespark, and today I want to talk to you about the local search ranking factors. So this is a survey that David Mihm has run for the past like 10 years. Last year, I took it over, and it’s a survey of the top local search practitioners, about 40 of them. They all contribute their answers, and I aggregate the data and say what’s driving local search. So this is what the opinion of the local search practitioners is, and I’ll kind of break it down for you. So these are the results of this year’s survey. We had Google My Business factors at about 25%. That was the biggest piece of the pie. We have review factors at 15%, links at 16%, on-page factors at 14%, behavioral at 10%, citations at 11%, personalization and social at 6% and 3%. So that’s basically the makeup of the local search algorithm today, based on the opinions of the people that participated in the survey. The big story this year is Google My Business. Google My Business factors are way up, compared to last year, a 32% increase in Google My Business signals. I’ll talk about that a little bit more over in the takeaways. Review signals are also up, so more emphasis on reviews this year from the practitioners. Citation signals are down again, and that makes sense. They continue to decline I think for a number of reasons. They used to be the go-to factor for local search. You just built out as many citations as you could. Now the local search algorithm is so much more complicated and there’s so much more to it that it’s being diluted by all of the other factors. Plus it used to be a real competitive difference-maker. Now it’s not, because everyone is pretty much getting citations. They’re considered table stakes now. By seeing a drop here, it doesn’t mean you should stop doing them. They’re just not the competitive difference-maker they used to be. You still need to get listed on all of the important sites. All right, so let’s talk about the key takeaways. The real story this year was Google My Business, Google My Business, Google My Business. Everyone in the comments was talking about the benefits they’re seeing from investing in a lot of these new features that Google has been adding. Google has been adding a ton of new features lately — services, descriptions, Google Posts, Google Q&A. There’s a ton of stuff going on in Google My Business now that allows you to populate Google My Business with a ton of extra data. So this was a big one. Everyone talked about Google Posts, how they’re seeing Google Posts driving rankings. There are a couple of things there. One is the semantic content that you’re providing Google in a Google post is definitely helping Google associate those keywords with your business. Engagement with Google Posts as well could be driving rankings up, and maybe just being an active business user continuing to post stuff and logging in to your account is also helping to lift your business entity and improve your rankings. So definitely, if you’re not on Google Posts, get on it now. If you search for your category, you’ll see a ton of businesses are not doing it. So it’s also a great competitive difference-maker right now. Google Q&A, a lot of businesses are not even aware this exists. There’s a Q&A section now. Your customers are often asking questions, and they’re being answered by not you. So it’s valuable for you to get in there and make sure you’re answering your questions and also seed the Q&A with your own questions. So add all of your own content. If you have a frequently asked questions section on your website, take that content and put it into Google Q&A. So now you’re giving lots more content to Google. Photos and videos, continually post photos and videos, maybe even encourage your customers to do that. All of that activity is helpful. A lot of people don’t know that you can now post videos to Google My Business. So get on that if you have any videos for your business. There are so many new fields in Google My Business. If you haven’t edited your listing in a couple of years, there’s a lot more stuff in there that you can now populate and give Google more data about your business. All of that really leads to engagement. All of these extra engagement signals that you’re now feeding Google, from being a business owner that’s engaged with your listing and adding stuff and from users, you’re giving them more stuff to look at, click on, and dwell on your listing for a longer time, all that helps with your rankings. Reviews continue to increase in importance in local search, so, obviously, getting more Google reviews. It used to be a bit more of a competitive difference-maker. It’s becoming more and more table stakes, because everybody seems to be having lots of reviews. So you definitely want to make sure that you are competing with your competition on review count and lots of high-quality reviews. Getting keywords in reviews, so rather than just asking for a review, it’s useful to ask your customers to mention what service they had provided or whatever so you can get those keywords in your reviews. Responding to reviews. Google recently started notifying users that if the owner has responded to you, you’ll get an email. So all of that is really great, and those responses, it’s another signal to Google that you’re an engaged business. Diversify. Don’t just focus on Google My Business. Look at other sites in your industry that are prominent review sites. You can find them if you just look for your own business name plus reviews, if you search that in Google, you’re going to see the sites that Google is saying are important for your particular business. You can also find out like what are the sites that your competitors are getting reviews on. Then if you just do a search like keyword plus city, like “lawyers + Denver,” you might find sites that are important for your industry as well that you should be listed on. 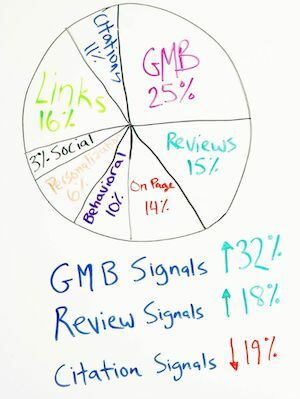 So check out a couple of your keywords and make sure you’re getting reviews on more sites than just Google. Then links, of course, links continue to drive local search. A lot of people in the comments talked about how a handful of local links have been really valuable. This is a great competitive difference-maker, because a lot of businesses don’t have any links other than citations. So when you get a few of these, it can really have an impact. They really talk about focusing on local-specific sites and industry-specific sites. So you can get a lot of those from sponsorships. They’re kind of the go-to tactic. If you do a search for in title sponsors plus city name, you’re going to find a lot of sites that are listing their sponsors, and those are opportunities for you, in your city, that you could sponsor that event as well or that organization and get a link. All right. So I also asked in the survey: Where do you see Google going in the future? We got a lot of great responses, and I tried to summarize that into three main themes here for you. This is a really big one. Google does not want to send its users to your website to get the answer. Google wants to have the answer right on Google so that they don’t have to click. It’s this zero-click search result. So you see Rand Fishkin talking about this. This has been happening in local for a long time, and it’s really amplified with all of these new features Google has been adding. They want to have all of your data so that they don’t have to send users to find it somewhere else. Then that means in the future less traffic to your website. So Mike Blumenthal and David Mihm also talk about Google as your new homepage, and this concept is like branded search. What does your branded search look like? So what sites are you getting reviews on? What does your knowledge panel look like? Make that all look really good, because Google doesn’t want to send people to your new website. David Mihm is a strong voice in this. He talks about how Google is trying to diversify how they rank businesses based on what’s happening in the real world. They’re looking for real-world signals that actual humans care about this business and they’re engaging with this business. So there’s a number of things that they can do to track that — so branded search, how many people are searching for your brand name, how many people are clicking to call your business, driving directions. This stuff is all kind of hard to manipulate, whereas you can add more links, you can get more reviews. But this stuff, this is a great signal for Google to rely on. Engagement with your listing, engagement with your website, and actual humans in your business. If you’ve seen on the knowledge panel sometimes for brick-and-mortar business, it will be like busy times. They know when people are actually at your business. They have counts of how many people are going into your business. So that’s a great signal for them to use to understand the prominence of your business. Is this a busy business compared to all the other ones in the city? Then, of course, a trend to monetize as much as they can. Google is a publicly traded company. They want to make as much money as possible. They’re on a constant growth path. So there are a few things that we see coming down the pipeline. Local service ads are expanding across the country and globally and in different industries. So this is like a paid program. You have to apply to get into it, and then Google takes a cut of leads. So if you are a member of this, then Google will send leads to you. But you have to be verified to be in there, and you have to pay to be in there. Then taking a cut from bookings, you can now book directly on Google for a lot of different businesses. If you think about Google Flights and Google Hotels, Google is looking for a way to monetize all of this local search opportunity. That’s why they’re investing heavily in local search so they can make money from it. So seeing more of these kinds of features rolling out in the future is definitely coming. Transactions from other things. So if I did book something, then Google will take a cut for it. So that’s the future. That’s sort of the news of the local search ranking factors this year. I hope it’s been helpful. If you have any questions, just leave some comments and I’ll make sure to respond to them all. Thanks, everybody. You’ll be in for a jam-packed hour of deeper insights and takeaways from the survey, as well as some great audience-contributed Q&A.